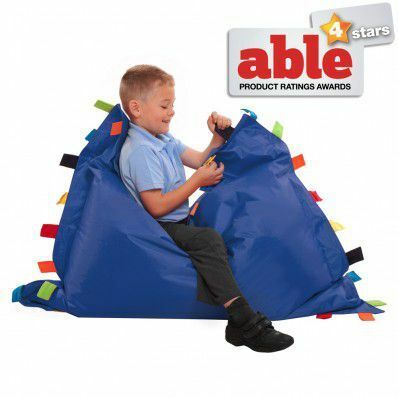 For use in sensory learning spaces and for promoting inclusive learning within pre-school and primary study spaces these sensory touch tags bean bags promote learning through touch and sight. The textured tags are useful as a calming aid for children with sensory processing disorders. Hands can be kept busy by touching and stroking the textured tags. The colourful tags feature five different surface textures including soft, silky, stretchy, ridged and rough. Designed especially for tactile discrimination activities. The tag bean bag can be shaped into different positions to find the most comfortable sitting posture as the bean filling moulds to the shape of the body. A great source of proprioceptive input. Pupils will feel safe, secure and able to concentrate whilst learning on this comfy bean bag.